This problem was shown to be NP-hard in this paper in 2008. So, not only is it difficult to reconstruct phylogenetic networks, it is even difficult to check if a given network is consistent with certain gene trees or the estimated species tree. In this paper in 2010, Charles Semple, Mike Steel and I studied for which classes of networks this problem remains hard and for which ones it becomes easy. In particular, we showed that the problem becomes polynomial-time solvable on so-called binary tree-child networks. 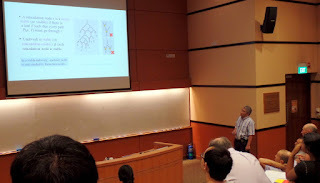 However, we were not able to extend our algorithm to a more general class of networks called reticulation visible networks, which were later called stable networks by others. A network is reticulation visible if, for each reticulation r, there exists a leaf x such that, if one would delete r, there would be no more directed path from the root to x. The idea behind this class of networks is that the leaf x gives us some information about the reticulation r. And how can we possibly expect to reconstruct reticulations if we don't have any information about them? Moreover, the class of reticulation visible networks seems to be much larger than the class of tree-child networks. The paper has not been published yet, but the proof seems correct to me, and is very clever and elegant. Hence, the first of the seven "phylogenetic network millennium problems" has been solved! Below you see Louxin Zhang presenting the algorithm at the Phylogenetic Networks workshop in Singapore.